Chichester City ended a run of three straight defeats as they smashed eight past bottom club C & K Basildon on Sunday in the FA Women’s National League. The visitors scored four goals either side of half-time to brush off the recent results with Jess Lewry and Kim Stenning starting the rout. Molly Clark hit the Essex side for four while Sara Tubby came off the bench to grab a brace. Captain Lauren Cheshire and goalkeeper Lauren Dolbear returned to team after spells on the sidelines while Tash Stephens also started. While the winds seemed to be settling in around the country Chichester went looking for their first win after three consecutive defeats against a side battling for survival. The game started hard and fast for Chi who had pace down the wings to attack first through Nadine Bazan and then through Stephens who’s cross was controlled by Stenning but neither Gemma Simmonds or M.Clark could get a shot away. Basildon were set for a busy afternoon in defence with Chi launching attack after attack, Mollie Debell forcing a corner on M.Clark’s effort before the midfielder was denied by Danielle Sillitoe. 26 minutes gone there were no goals but it would soon change in seven minutes when Lewry was fouled just inside the box by Nicola Moore and the referee pointed straight to the spot. Her second penalty of the season was calmly put away by Lewry into the bottom of the net to open the scoring. Three minutes later the lead was doubled as Stenning netted her first Chi goal with a side-footed volley off a great Bazan delivery. In the 33rd minute it was 3-0; M.Clark having just skied an effort cooly finished from 10-yards a low Stephens cross that Lewry dummied for the midfielder. The chances continued to come for the hosts and on the stroke of half-time M.Clark got her second of the game. In open play, the beach soccer ambassador had the time to float the ball across the box, beating Chelsea Hinz. It was smiles all round for Chi at the break and they had another 45 to go. The visitors started the second half much the way they finished the first and there were chances for defenders Tiff Taylor and Bazan who were denied by the woodwork and the keeper. Dolbear was having a quiet game but did her job well when called upon and was backed up by a strong defensive display. The first goal of the second half was scored in the 63rd minute when M.Clark completed her hat-trick. A short corner routine with Simmonds allowed M.Clark the chance to fire back into the box, perhaps aided by the wind, the ball nestled into the far corner of the goal. 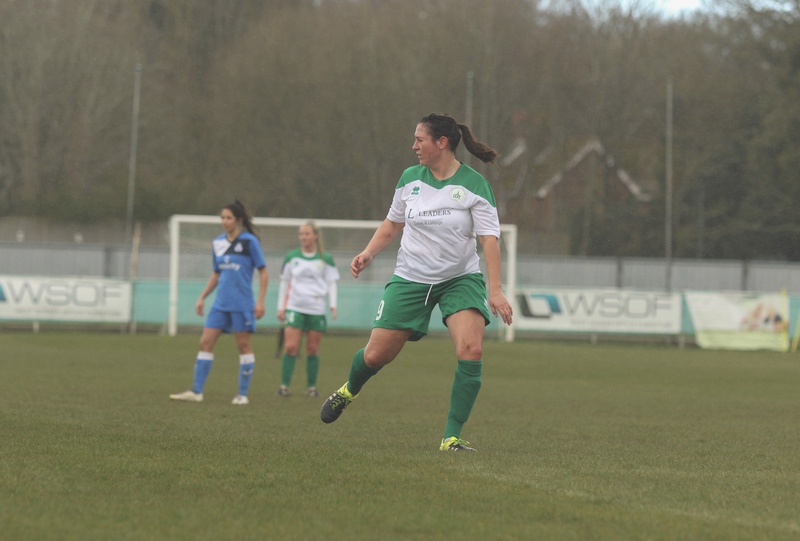 Sara Tubby entered the pitch replacing fellow striker Stenning and within four minutes the former Brighton & Hove Albion player joined the scoresheet. Who else to assist but the hat-trick hero M.Clark, showing her skills to lure the defence she scooped the ball with ease over for Tubby to run onto and flick over Hinz in the Basildon goal. The game had been over in terms of result for a while but the attacks did not die from Chi who were looking firmly put to bed the recent results. Holly Turner had the best chance to steal the clean sheet away from Dolbear but the keeper came out to challenge to stutter the attack before Waine got her foot in to clear as the attacker had an empty net in front of her. Helen Ogle, another substitute, was denied by the post while Stephens and Tubby also couldn’t convert as the game entered the final stages. Goal number four for M.Clark came in the 86th minute as she fired low Ogle’s cross from the left. The final blow came in the first minute of second-half stoppage time as Tubby bagged her brace. Stephens’ cross was brought down by the defender – a possible handball – but Tubby didn’t call for it as she controlled, turned and slotted the ball into the net. A great team performance resulted in eight goals, four different goalscorers, three points and a clean sheet. The team now have a break before heading back on the road when league leaders Coventry United await on Sunday, March 31st at Daventry Town FC.